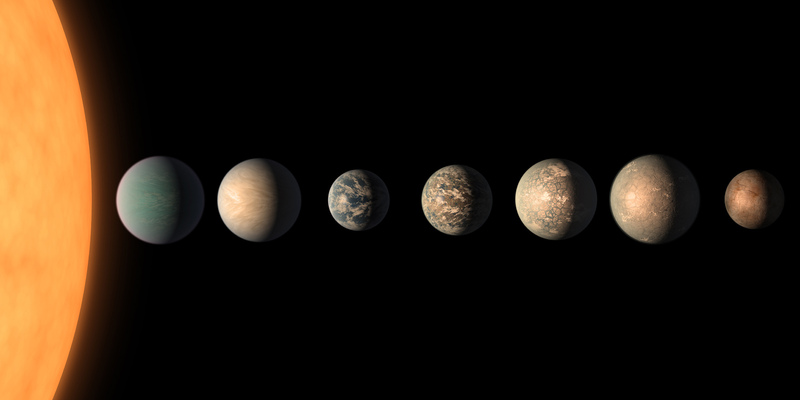 A new study has revealed the compositions of the seven TRAPPIST-1 exoplanets in unprecedented detail, showing them to be rocky worlds that could potentially have water. Two of the system’s planets were discovered in 2016 by the European Southern Observatory’s (ESO) Transiting Planets and Planetesimals Small Telescope (TRAPPIST) in Chile. NASA’s Spitzer Space Telescope confirmed the presence of these two and found five more in 2017. All the planets orbit the cool star closer than Mercury orbits our Sun and may therefore be tidally locked to the star, with one side permanently facing toward it and the other permanently facing away from it. Based on the planets’ densities, some may have masses that are up to five percent water, which would amount to 250 times the water in Earth’s oceans. Whether the planets’ water would be in the form of ice, liquid, or vapor depends on the amount of heat each receives from the star, which has just nine percent of the Sun’s mass. Because the planets are so tightly packed, anyone standing on the surface of one would be able to see the system’s other six planets, which would appear larger than the Moon looks from Earth. After last year’s discovery that the system hosts seven planets, scientists stepped up their efforts to determine the composition of these worlds. NASA’s Kepler space telescope was trained on them, and Spitzer was used in a 500-hour study of the system, which runs through March of this year (2018). A team of researchers led by Simon Grimm of the University of Bern in Switzerland created individual computer models for each planet based on factors already known about them, such as their masses, orbital periods, and various other data, using techniques developed in the past year. While new data produced by the computer models is not enough to show their actual appearances, it does shed light on their densities. Carey is co-author of a paper on the study accepted for publication in the journal Astronomy and Astrophysics. Scientists were able to determine the planets’ densities because they orbit so close to one another, enabling the use of “transit timing variations.” Each planet exerts a gravitational force on the system’s other planets, slightly changing the timing of their transits in front of the star. Measuring the variations in the planets’ transit times enables scientists to estimate the planets’ masses, then use their masses and radii to calculate their densities. 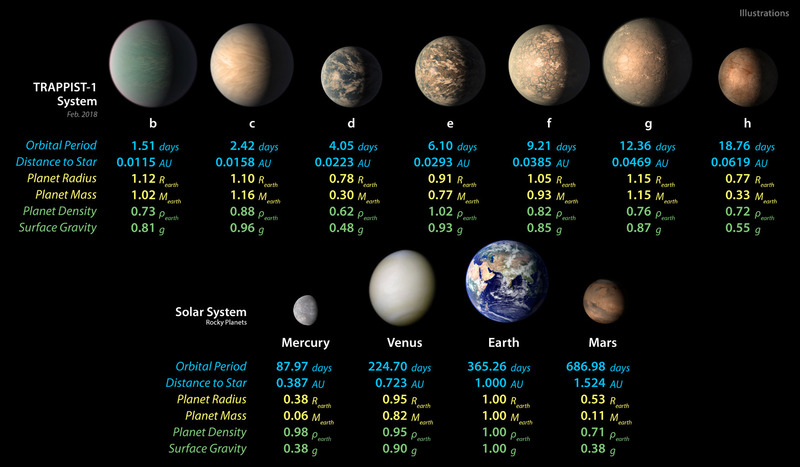 Based on the calculated densities, the researchers offered educated guesses on the planets’ compositions. Innermost planet TRAPPIST-1b likely has a rocky core and an atmosphere much thicker than Earth has. TRAPPIST-1c also has a rocky core, but its atmosphere is much thinner. 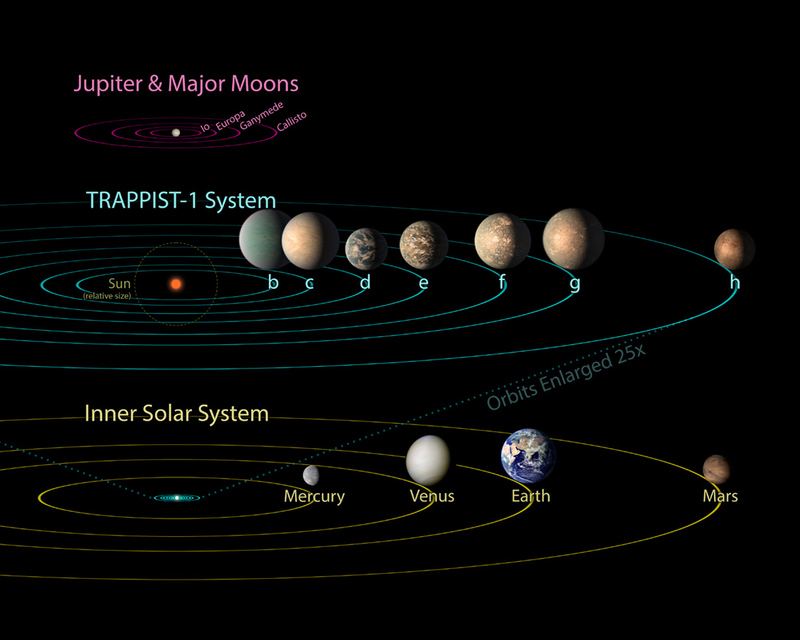 At just 30 percent the mass of Earth, TRAPPIST-1d is the lightest of the planets. Low-density worlds like this one are often surrounded by an envelop of volatile substances; however, this would be possible only if the planet has a thick atmosphere, an ocean, or an ice layer, or some combination of all three, a matter that remains unknown. With a density slightly higher than that of Earth, TRAPPIST-1e has a higher rock content than any of its neighbors and may have a dense iron core. While this planet is most like Earth in terms of size, density and level of radiation received from its star, scientists do not know why it is denser than the system’s other planets or whether it harbors a thick atmosphere, ocean, or ice layer. 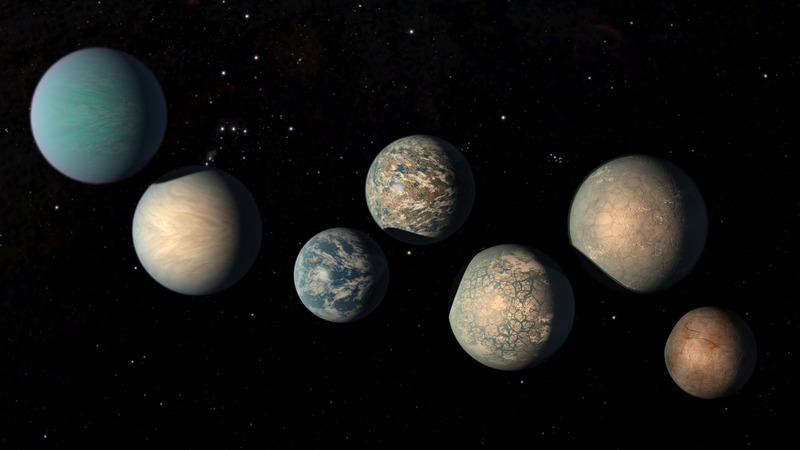 The three most distant planets, TRAPPIST-1f, g, and h, could be cold enough to have water ice on their surfaces. They may have thin atmospheres incapable of holding the heavier molecules Earth has, such as carbon dioxide. “It is interesting that the densest planets are not the ones that are closest to the star, and that the colder planets cannot harbor thick atmospheres,” said Caroline Dorn of the University of Zurich in Switzerland, also a study co-author. 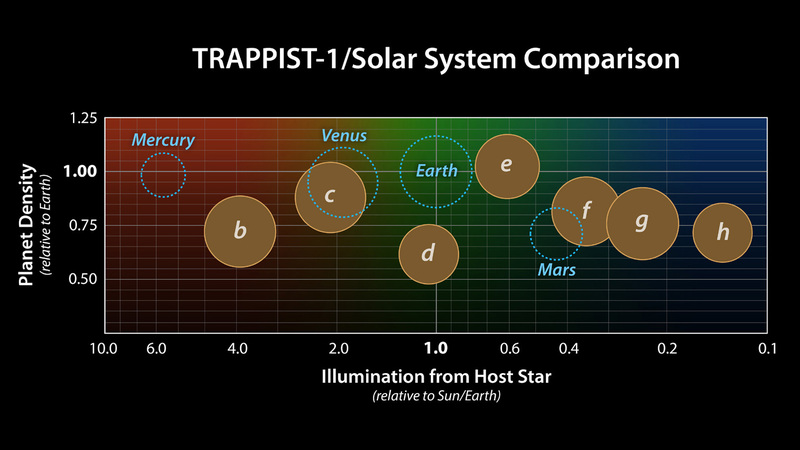 Recently, the planets were studied with NASA’s Hubble Space Telescope (HST), which found that TRAPPIST-1d, e, and f do not have hydrogen-dominated atmospheres. TRAPPIST-1g’s atmosphere might contain hydrogen. Further study of the planets’ atmospheres will be done using NASA’s James Webb Space Telescope (JWST), set to launch in 2019.
i VOLUNTEER TO BE THE FIRST TO GO AND LIVE ON THESE PLANETS BEFORE THE REST OF HUMANITY SHOWS UP AND DESTROYS THEM JUST AS WE HAVE DONE TO earth!!!! !